We have a little bit of a problem here. There is no more iconic number in Michigan Football history than the coveted #1. In 133 years, only 12 players have worn the number. The receiver legacy started back in the late 70's with Anthony Carter, the Human Torpedo, who averaged a ridiculous one touchdown for every fourth catch. For a Schembechler offense, the fact that anyone even knew a receivers name was an accomplishment. AC was so great at his position, that he made the #1 jersey an iconic symbol for great receivers at Michigan. Since Carter, only 5 receivers have worn the #1. And it'll be 9 years this season since Braylon Edwards, the last to wear it, has worn it. Let's just take a moment to recognize that the first player at Michigan to wear the #1 was named Angus. That needs to be woven into the lore of the number one somehow. Just sayin. So what's the issue here? Well, as you can see, we had a pretty nice run there with receivers and the #1 jersey. Greg McMurtry and Derrick Alexander was surely worthy. Maybe not so much so with Tyrone Butterfield...which is a rather bitter story in and of itself. But certainly David Terrell and Braylon Edwards enjoyed great success with the single digit. Seems to me we're due for someone new to wear it. Right? First of all, the selection process for who gets to wear the jersey is one that is shrouded in mystery. Always has been. Under the Lloyd Carr regime, it was never made public how the decision got made, but we assume that it started by Lloyd (or maybe a few of the coaches) making the decision to give it to Butterfield and Terrell. By the time Edwards wore the number during his junior season, he approached the staff to ask permission. He had to earn it. I think it was then that the lore of the #1 began to snap into focus. All of the sudden, wearing the single digit uniform at Michigan carried a meaning that was reflected by the coaches. It wasn't just about the his ability, but more about what kind of person he needed to be. It was significant. But Edwards found a way to earn the jersey, and he did his coaches proud. Maybe no other player has put the #1 on such a pedestal as Edwards did. So much so that after he went pro, in 2006 he went as far as to create an endowment at Michigan for a receiver who wears the coveted numero uno. ESPN reported on this back in late 2009. The Wolverines' former star wide receiver and '04 team MVP is three years into a five-year funding plan that amounts to $500,000 in endowed scholarships at his alma mater -- $80,000 annually for the football program and a pair of $10,000 academic scholarships for bright and needy students from inner-city Detroit. "First and foremost, my parents have always stressed to me the importance of giving back," says Edwards, whose father, Stanley Edwards, is a former Michigan fullback and NFL journeyman. "The big thing for me was once I made it into the NFL and was pretty comfortable, I wanted to give something back to the University of Michigan. The University of Michigan gave me a scholarship. They took a chance on a kid from inner-city Detroit. Gave me a chance to get an education as well as play football on a main stage. They also did it for my father as well. So the Edwards family was pretty happy to be a part of that Michigan tradition. To be able to give a scholarship back was definitely something we wanted to do." Awesome! That's a lot of money. So far so good. Hang on just a minute. He sure does have say. A lengthy Daily article from 2011 with multiple quotes from Stan, Braylon's father, tells another tale. When Rich was first hired and was assigning numbers to incoming freshmen, he noticed the #1 was available and issued it to an incoming defensive back. Rich was not aware of the tradition or the lore. One of many such mistakes that Rich made which we will not go into here. Fans, media and bloggers went crazy. It was a huge faux pas by the new coach. In May 2008 at a charity golf event in Ann Arbor, Edwards approached Rodriguez and corrected the new coach's error. Rodriguez had learned his lesson, but decided to shelve the #1 because "this isn't his first rodeo". It was clear he wanted nothing to do with the #1 or Carr or Edwards. Surely the #1 is back in play, right? When Hoke was hired, Edwards gave the new coach his blessing to assign the number as he saw fit...with the previous Edwards/Carr restrictions intact, I'm sure. I mean it is in writing. Coming on year 3 of the Hoke era and it would seem we're nowhere closer to a player wearing the #1 jersey. Although according to 2014 commit Drake Harris, the jersey is being used as a recruiting tool. But I doubt any promises are being made...especially since one of the Edwards/Carr restrictions is no freshmen. About a year ago, Braylon called out Hoke on Twitter for not recruiting his younger brother, Berkley Edwards, who was a running back for nearby Chelsea High School. "I don't understand how my brother has the 8th (fastest) time in the country in the 60m, ran for 1800 yards last year and 20 and UofM wont call," Edwards tweeted around 8 p.m. Either Edwards feels that his endowment affords him the right to make such assertions, or he's just jaded from years of bitterness with his alma mater. Either way, the rift between Braylon and Michigan is growing. Another variable in the equation are the new "Michigan legend" patches introduced in 2011. At the current moment, #21 is the most valuable number for a receiver to wear at Michigan. Ironically, Desmond Howard, the most celebrated and decorated receiver in Michigan Football history never wore the number one. Who wears his former number is not up to him, but rather is assigned by coaches with no outside interference. It seems like a huge conflict of interest to have two numbers vying for the current top receiver. 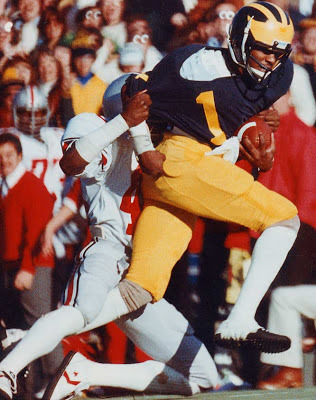 With the current state of the #1 in limbo and the focus on the legendary #21 cemented in Michigan lore, it would seem that we're at least a few years away from seeing the maize number 1 on a blue uniform. Something has to give between Braylon and Michigan. It's almost as if the #1 is being held hostage. The longer it's not on the field, the louder the speculation grows. The #1 does that to us. There's great tradition there. It's worth having the debate.